The ‘Reggio Emilia’ approach to education originated in Northern Italy right after the end of World War II. It was created by Lorris Malaguzzi, a teacher, and parents who lived in the area around Reggio Emilia. The number of Reggio settings grew rapidly and the reputation of the alternative approach grew stronger over the years. During the last couple of years it has certainly attracted its fair share of attention. There are many benefits to this approach and this is why we are arming you with the information on why Reggio Emilia Education works in early year’s education. One of the key principles that you will find at any Reggio Emelia school is the fact that children have rights when it comes to their learning. Children are put at the centre of the practice by being treated as a ‘knowledge bearer’. By valuing children in this way educators have to put more emphasis on really listening to the children. Children need ample time and space to express themselves. Children in Reggio settings are active builders of knowledge, and they are encouraged to be researchers. Many of the educational experiences at Reggio take the form of projects, where children have opportunities to actively participate, explore, and question things. There is also a very strong emphasis on the social development of children as part of a community and their relationships to other children, their families and teachers. So how are the key principles of this innovative approach adapted into nursery schools? This is probably one of the most well-known aspects of the Reggio Emilia approach. The Reggio approach starts from the idea that children use many different ways (‘one hundred languages’) to express their understanding, thoughts and creativity. This perspective has been endorsed by many artists, such as Henry Matisse, who wrote a series of essays entitled Looking at Life with the Eyes of a Child. These different ways of thinking, exploring and learning are expressed through drawing, sculpturing, music, dance and movement, painting, drama and pretend-play. This is a critical element as to why Reggio Emilia education works, as children learn so much through expressive arts. Reggio Amelia is very focused on long-term learning projects which mean that kids get to have the opportunity of extensive research. These projects include real-life problem solving techniques amongst peers, as well as opportunities for creative thinking and exploration. Children are often involved in these projects in small groups, while the rest of the class get involved in self-chosen tasks. A project normally begins with the teachers observing and questioning kids about their topic of interest. Then materials, questions and opportunities are provided to encourage kids to explore their topic of interest further. The results can sometimes be surprising as a result of what kids identify in their project. Therefore, curriculum planning and implementation revolve around open-ended and often long-term projects, which are based on a balance between teacher-directed and child-initiated activity. For instance, a project might be spurred by a child coming to school with new shoes – a potential learning journey in this case would be to find out how shoes are made, possibly also visiting a shoe-making workshop and discussions about clothing and fashion design. The opportunities to learn are endless. A massive part of the Reggio Emilia approach is documentation. It is multi-faceted, but is mainly used as a way to study children’s learning. Documentation focuses on the experiences that children are involved in and the skills they are acquiring through these experiences. The learning record is a reflection of interactions between teachers and children, amongst the children themselves, as well as children and their environment. It is a way to help teachers to assess the children’s learning and develop the curriculum from term to term. Children are given plenty of opportunities to ask their own questions and problems and discuss possible directions to their learning. Teachers are skilled observers of children; they collect a variety of data about each child’s learning. These data points are used as the basis to analyse children’s skills and track their learning journey. In Reggio settings, part of this documentation is made visible in the classroom, keeping the memory of learning and a sense of ownership clear in children’s minds. A strong network of relationships is established between the children, parents and teachers of Reggio settings to promote continuous communication between them. These key stakeholders work together to create a spirit of cooperation of knowledge. There is a strong focus on social collaboration and working in groups, where each child is an equal party. Parents may participate actively in the learning development of their children. 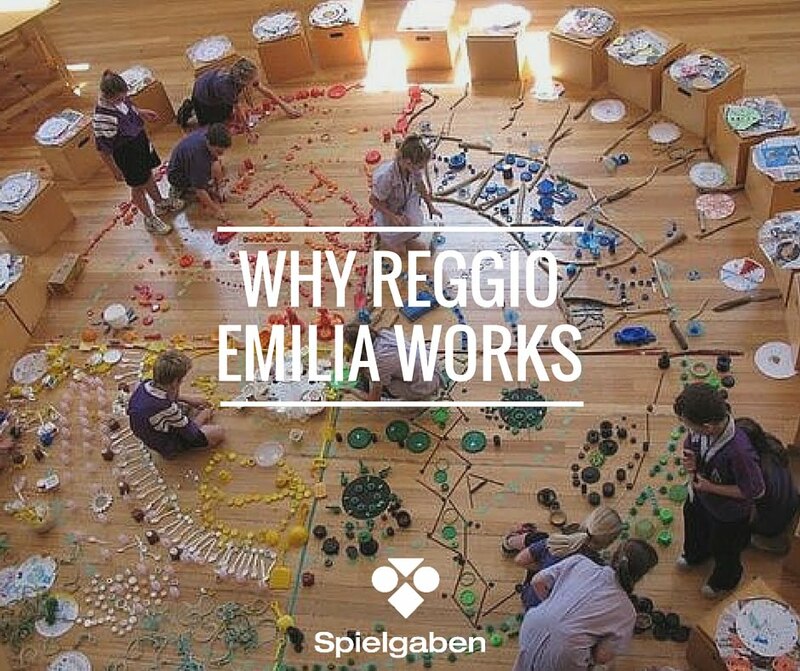 In Reggio Emelia settings the school works very closely with parents in sharing and developing the children’s learning in order to ensure a consistent approach between school and home. Schools encourage parents to be involved as much as possible in the life of the setting by volunteering to participate in events and shadow or lead activities. Often parent workshops on various aspects of curriculums and parent classes on child development are held to improve communication further. Good planning of the environment involves the creation of new learning spaces. In the traditional Reggio approach, in Italy and elsewhere, the classroom is generally filled with indoor plants and vines, and is covered with natural light; it opens up to a central space (the ‘piazza’), kitchens are open to view and access to the surrounding community is assured through wall-size windows and courtyards. Photographs of children’s activities and sample displays of their work, even with transcriptions of their discussions, are carefully positioned inside the classroom. There are also studio spaces in the form of a large, centrally located ‘atelier’. However, these are just guiding principles, and every Reggio school is unique. In addition, the school is not expected to look the same from the beginning to the end of the school year. Often schools will promote the idea that classrooms should be aesthetically pleasing yet minimalist. The classroom layout and resources reflect the profile of the community which surrounds the setting. There is a strong emphasis on natural resources and the study of the natural surroundings. Most Reggio Emelia schools are situated in areas where there is direct access to the outdoors and they promote learning outdoors as a priority as well. Resources from the outdoors are often used in the classroom too. The aim is to maximise children’s engagement with the learning resources like natural materials that can be used in more ways than one to also encourage an interest in the natural world and exploration. Exploration of the natural environment is key to why Reggio Emilia education works as it stimulates children in more ways than one. It’s not a traditional classroom with assigned seats and roll call. Art hangs at the children’s eye level, and they can easily see where supplies are in the class and are encouraged to use them. The Maplewood Richmond Heights Early Childhood Center in Maplewood, Missouri launched their own Reggio Emilia programme in 2005. The school’s administration and teaching staff, says Brenda Fyfe, Dean of the School of Education at Webster University, both believe that “children should have a voice and a sense of agency in negotiating the learning process, and have the right to engage in experiences that are meaningful to them.” Webster University, a partner with the Early Childhood Center, is a leader in bringing Reggio Emilia to St. Louis-area schools. “They understand that children and adults learn through an active process of exploring their world together, exchanging ideas, and learning from and with each other,” Fyfe adds. In Heather Bailey’s kindergarten classroom in Mapleweood, children climb in and out of a cardboard box with a large umbrella sticking out of the top. The inventive contraption is a “hot air balloon,” the recent topic of their class discussions. They chart maps of their hot air balloon journeys and share stories of their make believe travels. Bailey incorporates Reggio’s “hundred languages,” a metaphor for the way the children express themselves. The languages include writing, building, sculpting, and dramatic play. “Play isn’t something we do to take a break,” she says. Bailey tries to include play in learning, whether it’s creating a story while sculpting clay figurines or learning how hot air balloons are able to travel before building their own full-size model. The students are seen as important members of the community, and they often take walks through the neighbourhood to learn about the world around them. The transition from negotiated learning to traditional classroom learning has not been an issue for their students. Finally, What does the Research Say? Laurie Kocher wrote a paper on the effectiveness of the Reggio Emilia approach. You can find the full research paper here. We have provided a summary of the findings. Reggio Emilia is a cosmopolitan metropolis of 130,000 people in the Emilia Romagna region of Northern Italy. Over the past 50 years, their school system has spawned a distinctive and innovative set of philosophical assumptions, curriculum and pedagogy, method of preschool school organization, and design of environments, which, taken as a unified whole has become known as the Reggio Emilia Approach. This approach to early childhood education has been widely recognized; its innovative programmes acknowledged by educators, psychologists, and researchers from all over the world as the most exceptional example of the highest quality early education that the world has ever seen as reported in Newsweek. An exhibition of the children’s work from Reggio Emilia, The Hundred Languages of Children, has toured the world, to wide acclaim. In several empirical studies of the early 1990s, researchers agreed that the Reggio Emilia philosophy was primarily based on relationships. One researcher provided first hand, qualitative observations and research insights in her description of the origins, educational results generated in Italy, and implications regarding successful adaptation in other cultures. She explained that Reggio Emilia preschools are part of a public system that strives to serve children’s welfare and the social needs of families while supporting children’s fundamental right to grow and learn in favourable environments with key relationships that include cooperative peers and caring, professional adults. Child outcome research is not intrinsic to the way educators work in any of educational approaches. Administrators in Reggio Emilia have used parent interviews and questionnaires to gather information about their programmes (see Fontanesi, Gialdini, & Soncini, 1998). Findings from formal exit interviews with parents at the Model Early Learning Center in Washington, DC, are reported in Lewin (1998, pp. 354-356). However, Reggio and Reggio-inspired educators consider pedagogical documentation to be an instrument for “reflection and democracy” not assessment (Dahlberg, Moss, & Pence, 1999; Gandini & Goldhaber, 2001; Oken-Wright, 2001; Rinaldi, 2001b). Reggio Emilia is a completely different type of approach to education and it is becoming very popular all around the world and there are good reasons for it. There are extensive amounts of free resource which you can read HERE. Gandini, L., Etheredge, S & Hill, L. (2008). Insights and inspirations from Reggio Emilia: Stories of Teachers and Children from North America. Worcester, MA: Davis Publications. Edwards, G., Gandini, L. & Forman, G. (1998). The hundred languages of children: The Reggio Emilia Approach – Advanced Reflections . Westport, CT: Ablex Publishing Corp.
Scheinfeld, D., Haigh, K., & Scheinfeld, S. (2008). We are all explorers: Learning and teaching with Reggio principles in urban settings. New York: Teachers College Press. Gostei muito do artigo sobre a abordagem Reggio Emilia e, gostaria d obter mais informaçoes sobretudo na educação de criancas autista usando essa abordagem.